Are you planning on getting the current and latest Nova 3 or Nova 3i? You may want to hold it off a little bit longer for this new announcement coming from Huawei. 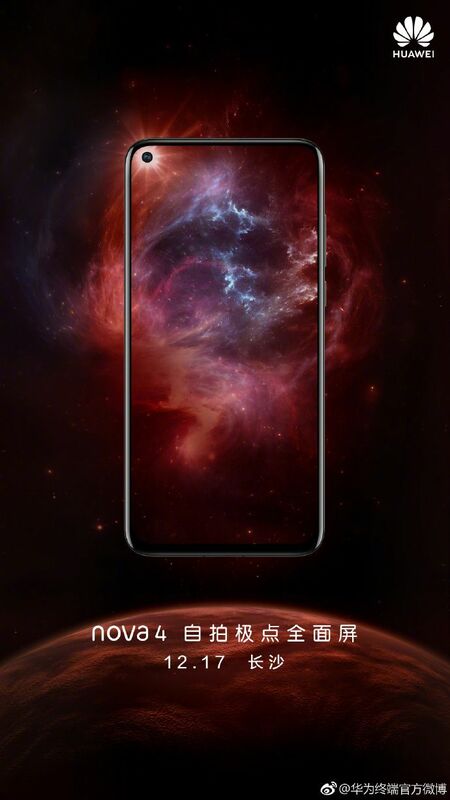 The Chinese tech giant has just confirmed that they are to formally launch a new generation of the successful Nova series. The Huawei Nova 4 is now set to be unveiled on December 17 in China according to the company's Weibo account as spotted by MySmartPrice website. While a lot of things are still unknown about this device, the company has already teased one of its major changes in terms of design that will set this phone apart not just from the previous Nova iterations but also from all Huawei smartphones that have ever been released - it's got a hole-punch cutout on the screen located at the upper left of the display holding the front camera. Apart from what we see in the image above released by Huawei China, the rest of the specs and feature remain unknown up until this very moment. Though it was initially rumored that it will be powered by Kirin 980 processor, but still unconfirmed yet. So those burning questions, together with its official pricing and availability will all be revealed on December 17, 2018 when the Chinese electronics giant formally announces it in their homecountry.